Lets catch up with the leaders of camp, Leviim! We had a nice end to last week, with really nice weather on Thursday and Friday. The חניכים enjoyed the outdoors with טבע, gaga, volleyball and basketball. Thursday night, they were tossed into the world of upper echelon dessert cuisine – “cake boss”. 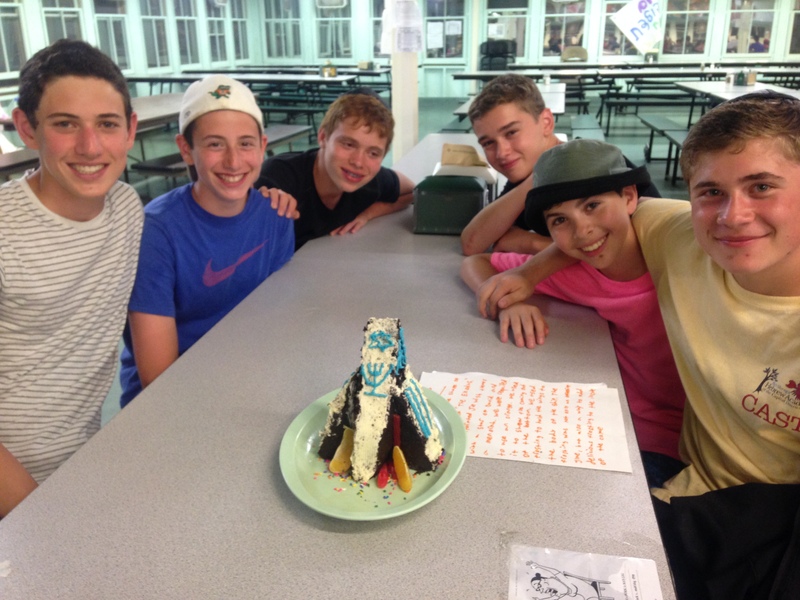 Cake boss consisted of several different teams where חניכים had to design an outer space-themed cake with certain ingredients for our judges ( a.k.a the מדריכים) to eat. Shabbat was filled with plenty of fun and relaxation, giving the kids plenty of energy for יום ישראל ( Israel Day ) on Sunday. יום ישראל featured several fun activities involving Israel and Judaism, both educational and interactive as well as delicious too!. The day also featured traditional Israeli cuisine with shakshuka, falafel, shawarma, and pita. Additionally the חניכים were able to have fun entering the “שוק” (Israeli marketplace) and even take a “tour around Israel” on our own hayride, as well as a fun slip-n-slide to cool everyone down before the טקס ( performance ) to cap the night. The טקס featured several fun as well as powerful songs, dances and poems from members of our מחנה ( camp), featuring our בנות (girls) in a wonderfully choreographed flag dance, as well as several other חניכים who spoke and lit torches for the טקס. Today we kick off the start of a new ( and sadly final) week of first session, celebrating Aaron S.’s יום הולדת (birthday), as well as cheering for several of the חניכים in their basketball tournament today! Additionally, we will be preparing for our biggest event of the חודש(month), ZIMRIYAH! Zimriyah, our annual singing competition will feature 3 songs from each עדה throughout the night ( Thursday night) before we enjoy our last Shabbat together as an עדה.